What if last week was a bad dream? What if dreams where something is just out of reach are worse than total nightmares? What if the Indians had won six or seven of the games where they were tied or ahead in the eighth or ninth inning? What if their August Monday off sets them in the right direction? What if they realize that neither the Tigers nor the White Sox are a team to fear? 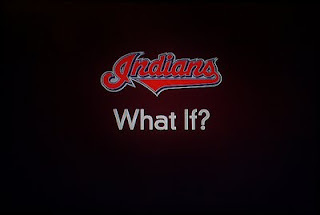 What if the Indians could put it together over the next two months of almost solid AL Central games? What if twenty-two games versus Detroit and Chicago are plenty to make a statement? What if I mean that those twenty-two games are a fine way to make a GOOD statement? What if the Indians do what they should and dominate the lesser teams still remaining on their schedule? What if Ubaldo Jiminez continues to hit 97-98 MPG and his spots? What if it's not 150 degrees every time he pitches? What if Justin Masterson and Josh Tomlin are the real Tribe studs for the next two three months? What if Carlos Carrasco is on the DL under false pretenses? What if he comes back in a bullpen role to make the team even stronger? What if Shin Soo Choo's reengineered thumb makes him stronger? What if we have to start calling him a "six-tool" player because of that thumb? What if our bullpen cosa nostra figures out that they are made men, and play like it? What if they let morons on Twitter just go unanswered? What if the two rookies in the lineup keep getting better? What if "We are all Kipnesses" becomes a trendy slogan? What if Fukudome is indeed getting comfortable in a new league? What if the Indians can just put it together again, at a level even close to the beginning of the season? A huge stretch of games starts tonight versus the Tigers. But it's not just three games this week that are "make or break." It's not far from that--being down four games is a lot better than being down eight games come Friday morning. Being down two is even better. But the Tribe plays the AL Central so much in the next month that a sweep either way vs. Detroit wouldn't be the end of the world--or a cause for Champagne. What if this Indians season didn't resemble the stock market? What if investors and Tribe fans didn't need a cabinet full of Pepto Bismol? Because it's Cleveland and there's no other way. Thome to the Tribe? You're kidding, right? How firm thy friendship, indeed.